Machu Picchu is an unusual and rare plant that is early to crop and very suitable for Northern European cultivation. The robust plants typically have large leaves, robust, large and ruffled with typical, almost C. baccatum type, good sized chili pods in a long tapering shape, 8 to 10cm (3 to 4in) long. The dense, upright growing plants are particularly handsome with dark green chillies maturing to rich chestnut brown and become wrinkled at maturity. They are ideal for growing in containers on the patio where they remain compact and crop early. Grown in the outdoors they are much larger and very productive, but the fruits will ripen later in the season. The taste is rich and smokey. Great when used fresh it also makes an excellent chilli powder. Very different from the familiar habanero and scotch bonnet types and a must have if you like something different. When the seedlings have produced their first pair of true leaves they can be potted on into individual 7-10cm (3-4in) pots. Use good quality potting compost and mix in some organic slow release fertiliser. Pot the chilli on again before it becomes root-bound. After the first flowers appear, feed every one or two weeks with a half-strength liquid tomato feed. You could also add some Seaweed extract to the water once a week. Chillies will take a few weeks to develop and a further couple weeks to turn from green to red. You may pick them off the plant any time after they are fully developed but the longer you leave them on the hotter they will become. Do not leave them on for too long, as delaying after the chili is ready for harvest will result in a decline of further yields. After picking, if you aren't going to eat them fresh, dry the peppers by putting them into a mesh bag, hang the bag up in a dry, airy, but not sunny spot. When they are completely dry, you can make paprika by grinding the peppers. Don't grind the stalks. You can regulate the spiciness of the result by including more or less of the seeds and veins. Be careful handling chilli seeds as they can cause a painful burning sensation: wash your hands thoroughly . DO NOT rub your eyes after handling chilli seeds!!! Chilli terminology is confusing; pepper, chili, chile, chilli, Aji, paprika and Capsicum are used interchangeably for chilli pepper plants in the genus Capsicum. The word Capsicum comes from the Greek kapto, meaning 'to bite' (a reference to pungency or heat). In Mexico a Capsicum is called a Chile pepper, while Chile enthusiasts around the World often use the spelling Chile or Chili. 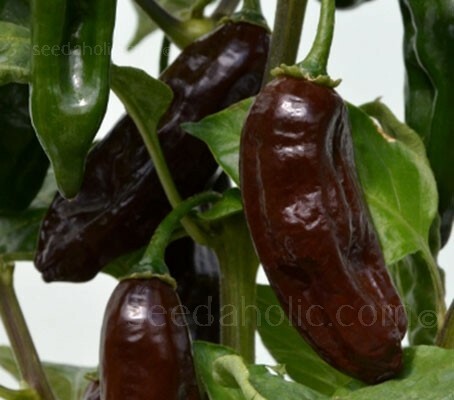 Many people are unaware of the fact that pepper plants are perennials. We typically plant the seeds, reap the benefits of our labour and then let the plants die off when the cold weather hits. However, with a little effort, you can over-winter your pepper plants and have a more fruitful harvest the following year. Over-wintering your plants will bring you a number of benefits. While everyone else is planting seeds in the spring, your plants will have a head start with well-established root systems and stems. The harvest will come much sooner and last much longer, producing much more that a first year plant would. At the end of the growing season, when the temperature begins to drop, pepper plants will become dormant. They are finished producing flowers and pods for the year and require much less sunlight and water. This is the time to begin the over-wintering process. The first step for over-wintering your pepper plants is to cut them back drastically, leaving only a short stem. This may seem a bit harsh, but it will make your plant concentrate its energy on re-growth, rather than trying to sustain older, un-productive vegetation. Re-potting your plants in a smaller container will also help your plant reserve its energy for hibernation. The most important step is to place your plants in a warm area that will give them the best chance of surviving the winter. Most of us don’t have a greenhouse, so a sunny windowsill will work well. If the temperature inside is comfortable to you, chances are your plants will enjoy it as well. Continue to water your plant, but do so much less often. The soil should be moist, but not damp as this will promote the growth of mould. If you are successful in over-wintering your pepper plants, you can be sure to have an incredibly fruitful harvest the following year. While everyone else is still watering seedlings, you will be enjoying fresh, delicious peppers.